Phi Theta Kappa was established in 1918 by Missouri two-year college presidents. It serves to recognize and encourage the academic achievement of two-year college students and provide opportunities for individual growth and development through honors, leadership and service programming. Today, Phi Theta Kappa is the largest honor society in American higher education with more than 1.3 million members and 1100 chapters located in 50 United States, U.S. territories, Canada, Germany, and Japan. In 1929, the American Association of Community Colleges recognized Phi Theta Kappa as the official honor society for two-year colleges. Phi Theta Kappa was established by the presidents of the Missouri junior colleges for women in 1918. 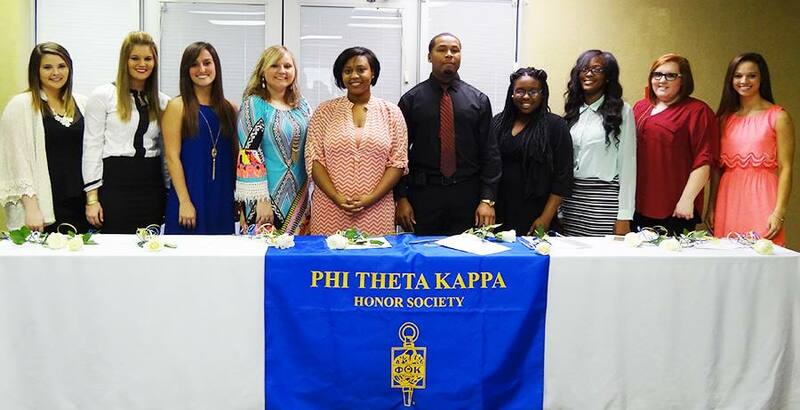 The purpose of Phi Theta Kappa is to recognize and encourage scholarship among associate degree students. To achieve this purpose, Phi Theta Kappa provides opportunity for the development of leadership and service, for an intellectual climate to exchange ideas and ideals, for lively fellowship for scholars, and for stimulation of interest in continuing academic excellence. The honor society began with six charter members under the name of Kappa Phi Omicron at Stephens College, Columbia, Missouri, in 1910. Beta Chapter of Kappa Phi Omicron was established at Lindenwood College, St. Charles, Missouri, in 1911. The societies continued until the spring of 1918. By that time, honorary groups had sprung up in many colleges. At a meeting of the presidents of the Missouri junior colleges for women in 1918, it was decided to organize a new honorary society, chapters of which would have a common character, standard, and similarity of organization. In choosing the name, the committee was influenced by the fact that the name of the honorary society for senior colleges is Phi Beta Kappa. Accordingly, the name Phi Theta Kappa was chosen, and the Society was incorporated in Missouri as a national organization. The few years following 1918 saw an official seal chosen, a charter drafted, song composed, and official pin representative of the Society adopted. For the first six years, Phi Theta Kappa confined its activity to women’s junior colleges, but in 1924 through constitutional amendment the field of activity was enlarged to cover all junior colleges. In 1925, Iota chapter at Synodical College, Fulton, Missouri, was added, and 1926 marked a further expansion with the addition of Kappa, Lambda, and Mu Chapters. These were the first coeducational colleges granted a charter, and Mu Chapter, at Miami, Oklahoma, was the first organized outside the state of Missouri. By 1928, Phi Theta Kappa had grown to fourteen chapters in six states. In that year a petition was drawn up by the Phi Theta Kappa Grand Council to be submitted to the American Association of Junior Colleges, asking that Phi Theta Kappa be recognized as the national honor society for junior colleges. The AAJC appointed a permanent standing committee on honor scholarship societies. This committee recommended that because of Phi Theta Kappa's relatively large membership, all honor scholarship societies then forming in institutions which were members of the AAJC should apply for a charter of Phi Theta Kappa. Official recognition was given to Phi Theta Kappa in 1929 by the American Association of Junior Colleges at the annual meeting of the Association November 18 and 19, in Atlantic City, New Jersey.